Top 5 Best Google Play Store Alternatives To Get Paid Apps For FREE! Now a days, there are tons of Android apps available on the Google Play Store. Some are paid, but most are available for free. Where most of the free apps serves our purpose, some of the paid apps are very essential for us. So, majority of us, don’t want to pay for those paid apps and we want all those apps for free. Though that’s possible, but that’s not legal. We should respect the app creators for their contribution and we should pay them to use those paid apps. But, some people wants to test the app for sometime and then they are likely to purchase the paid app. That’s why, in this article, we will talk about the top 5 best Google Play Store alternatives to get paid apps for free. But before we proceed, I should mention that, I’m not promoting piracy here. You people should pay the creators once you identify that you need the app for regular use. Another thing I need to tell you that, your Android devices might not support installing third party apps that are downloaded from elsewhere. So, before you install these alternatives to Google Play Store, you need to turn on the option that lets you install apps from unknown sources. To do this, navigate to Settings > Security > Unknown Sources. That’s it. Now you can install Play Store alternatives and use them to get paid apps for free. I’ve listed them below. But some of you might be wondering why these unofficial app stores aren’t available on Google Play Store itself and what’s the difference between official (G. Play Store) and unofficial app stores? Well, the reason is very simple. Official app store which is Google Play, is the main center of all Android apps. Android is also a Google product. So, they have also made the Play Store to keep and monitor the Android apps that’ll be used on their own OS Android. But all the apps available on Google Play Store, are monitored regularly for virus, data breach, security factors. So, whenever Play Store gets an app that is not following Google/Android’s guidelines, leaking users data, might harm their users, not following the legal rules of a country, they block it and remove it completely from their repository. On the other side, there are plenty of unofficial app stores available and none of them are anyway promoted or affiliated with Google Play Store. All of them are made by different individuals, developers or unofficial organisation. Here, the security check is not done, apps downloaded from these stores may contain virus and other harmful spywares. Many of the apps available in these unofficial apps stores may not follow Android’s guidelines or may not comply with legal rules of many countries. So, using apps downloaded from these stores is very risky. Then why people use these unofficial Google Play Store alternatives? Well, there’s also a reason. It’s because, many app developers upload the cracked and patched version of various paid apps and games in this unofficial stores which is not possible with Google Play Store. Only here, you can get paid apps for free of cost. Apart from that, many of the apps that are available here are the modified (Mods) version of various popular and paid/free apps/games. Modded games/apps comes with pre-unlocked levels and features. That means, you can play various levels of games or use various features of apps which are locked in their original version. That’s why these alternatives of Google Play Store are so much popular and used by millions of users worldwide. Below, I have listed all of the 5 alternatives to Google Play Store. But as most of these stores are promoting piracy and doesn’t follow the Google’s guidelines, I won’t give any download link of these apps. I also don’t recommend using these apps as they might spread virus to your devices and your personal information, credit/debit card data, banking information might get stolen and sold to other unethical hackers or persons. Blackmart is the king when it comes to Play Store alternatives. Here you will get all types of paid apps and games for free of cost. There are various modded games available as well. Many free apps are also available here. There are many filters available to filter the apps by rating, paid, free, etc. This is one of the best alternative to Play Store. But surprisingly, it’s also available on Google Play Store. So, without using any third party websites which contains pirated content, you can install it directly from the official store. The app is lightweight and easy to use. It also offers it users, a smart and user friendly user interface. But reportedly, there’s also a secret version available of this app which doesn’t follow guidelines. This version isn’t available on Play Store and you will need to take help of third party websites to get the secret version of 1Mobile Market where you can download paid apps for free of cost and get modded Android games too. This is also a great place to find various android apps and games. I’ve also used this app personally long time ago. But I used this app to download the apk files of the apps and games as Google Play Store directly installs the apps in your device without giving you the apk files. Back then, I didn’t know how to take backup of Android games using ES File Explorer. Now I know and use the backup method. But Mobogenie Market is well equipped with a large collection of various Android apps, games, live wallpapers and even ringtones! You can use the search feature to find various apps or files and get them directly into your device without directly installing them. This is also a great platform to get paid apps for free. But one unique feature that it has, but other Google Play Store alternatives don’t provide is, access all version feature. Sometime, some of the apps get worse when they are updated. Or sometime, the updated version of the apps doesn’t support our Android OS version completely and gives lagging experience. In those situations, you can use GetApk to install the old version of the app and enjoy that without any lag. A fact that I should mention here is, some of the apps might be legal and they also complies with all the guidelines. But still, these apps aren’t available on Google Play Store but can be installed from the alternative app stores. Why? This is because, when a developer goes to submit a newly developed app or game to Google Play Store, it needs a paid registration. Those developers who don’t want to spend money to submit their app on Play Store, simply submit their apps to unofficial Google Play Store alternatives like GetApk and others as this doesn’t charge money from developers to submit apps or games. I think all of you know about 4Shared or at least once you have landed on the 4Shared website when you tried to get any files. 4Shared is way more than just a Google Play Store alternative. It’s a whole file sharing and hosting platform. You too can use it to share your own files with your friends and other users. 4Shared will host the files for you and it’s also free. This is also available on Google Play Store. Though the Pro version might cost you money, but free version is also very useful. But I should remember you again that, if you are using these platforms, you are risking your personal details and your device data. As the apps available on these platforms are not authorised by any organisation, these might contain other harmful elements as well which might harm your device also. 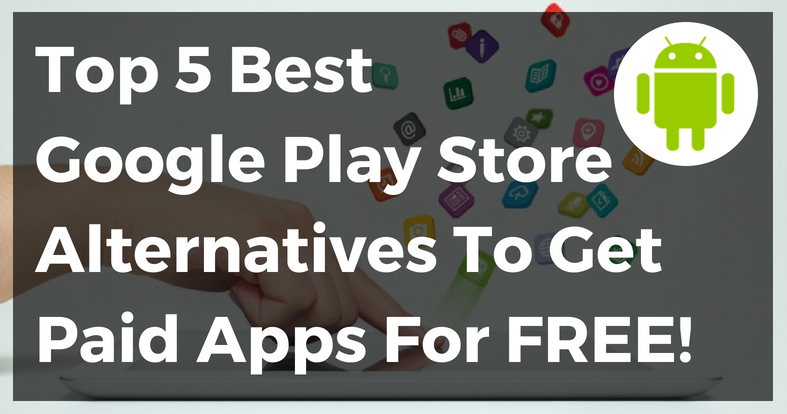 So, these were the top 5 best Google Play Store alternatives to get paid apps for free. If you also know some other stores which are better than any of these, you can mention in the comments section below.